Closing the student achievement gap in North Carolina starts with training outstanding classroom leaders. That’s the goal of the Northeast Leadership Academy (NELA), an NC State degree program that equips principals to serve in high-poverty, hard-to-staff and historically low-performing schools. NELA serves the county school districts of Bertie, Edgecombe, Franklin, Granville, Halifax, Hertford, Martin, Nash-Rocky Mount, Northampton, Roanoke Rapids, Vance, Warren, Washington and Weldon City. Tonya Little, Martin County Schools STEM coordinator and 2013 NELA graduate, knows the importance of placing high-quality leaders for these schools. Little’s own sense of urgency inspired her to cultivate a love of STEM learning in students. She helps middle schoolers create award-winning science experiments, explore robotics, film the daily school news with the latest technology and more. Little gained her leadership and student mentorship skills through two years of field-based experience with NELA. That’s why NELA graduates make a difference — their education takes place in the communities they serve. They develop the knowledge, skills and dispositions to be effective leaders of change through experiential education and mentoring. One experience that Little has been particularly excited about is the classroom garden at Riverside Middle School in Williamston. Students worked to construct 12 garden beds and a greenhouse, and grew and harvested their own vegetables. Teachers then integrated the garden into the school’s world history and science, innovation and engineering curriculums. Through this project, students experienced the real-world outcomes of STEM-based learning. “By utilizing what I learned through NELA, including project-based learning initiatives, I’ve seen students develop critical thinking skills and a more positive attitude that is helping them succeed,” said Little. The program also prepares graduates to impact student success by providing individualized leadership coaching, early career induction and support. Upon receiving their master’s degree in school administration, graduates make a three-year commitment to work in Northeast high-need schools. Larry Hodgkins just finished his first year as assistant principal at Riverside Middle School (he previously spent three years as assistant principal at South Creek Middle School in Robersonville). Hodgkins feels that NELA fundamentally changed his views of education and how he puts leadership into practice. Both Little’s and Hodgkins’ experience with student improvement fortunately is not unique. Research shows that it normally takes five years to fully implement school staff and policies that positively impact performance. Schools with first-year NELA graduates, however, already showed major improvements, which continued in following years. These gains encompass the academic and social aspects of student performance. Hodgkins noted that at South Creek, there was a 75 percent decrease in student discipline and increases in student achievement. At high schools with NELA-educated principals, there were decreased incidences of student conduct requiring school discipline and a rise in attendance. Creating a collaborative mindset continues to be a focus of NELA as the program educates its sixth group of students. Since the first class graduated in 2012, NELA has prepared more than 100 school administrators who are closing North Carolina’s student achievement gap. 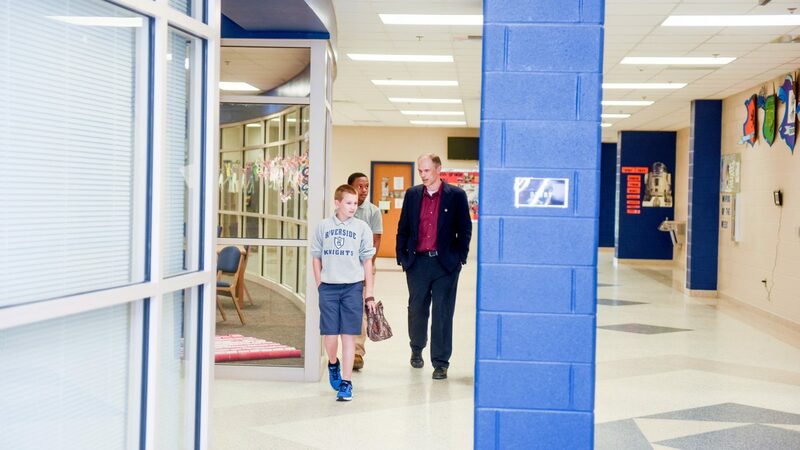 Hodgkins agrees, and is certain about how NELA has changed (and continues to change) schools and the educational outlook for students in Northeastern North Carolina. Learn more about the impact NELA graduates are making in schools and communities throughout Northeastern North Carolina.